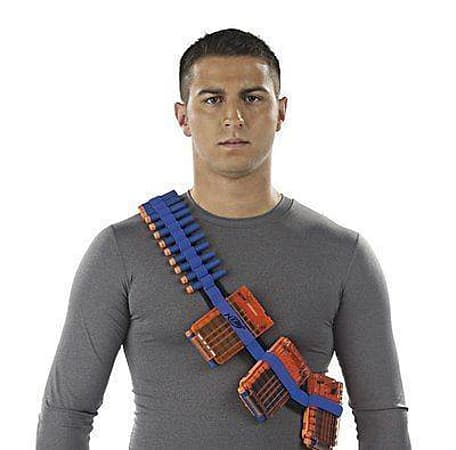 If you're going to take your N-Strike battling to the next level, you need the Bandolier Kit! The Kit gives you extra firepower with 2 Quick Reload clips and 24 Elite Darts, and you can strap up to 4 Quick Reload Clips and 12 Elite Darts to your body with the included Bandolier Strap! Your Quick Reload clips work with any Clip System blaster (sold separately) and the Elite Darts work with any Elite blaster and most original N-Strike blasters (sold separately). Charge into action with maximum firepower with the Bandolier Kit!